Hearing a loud “seep” or “tseep tseep” around your hummingbird feeder may indicate you have a pretty blue-throated hummingbird, (Lampornis clemenciae), nearby. He is easily recognized by the bright blue gorget, and is the largest hummingbird to visit the United States. The only other large hummer similar in size is his beautiful cousin, the Magnificent. MALE COLORING:The male has a gorgeous bright blue gorget with a striking white streak by the eye and jaw. Grey cheeks, a bright green crown and shoulders make this guy really stand out. His lower back can be a dark bronze green to black. The juvenile male is similar but much less of the striking blue. 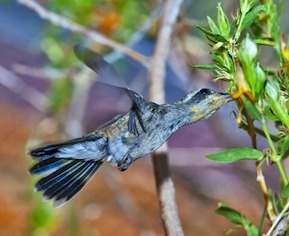 FEMALE COLORING: The female blue-throated gets left out of the spotlight with only a grey throat, but similar back and tail. SIZE: This is a largest "little buzz bomber" at about 5 ¼ inches and 8 grams in weight. That is 3 times larger than the smaller species and quite recognizable. BILL: This species has a long thin black bill; shorter than the Magnificent . TAIL: The tail is long and rounded, although a bit shorter than the Magnificent's with white tips. Loves streams, forests and mountain canyons. Migrates to Mexico in winters, but some lucky residents of southeast Arizona can have sightings all year long. They usually breed in October but will nest from late spring through the summer. Breeds in southwest Arizona, New Mexico and western Texas. His nest is usually over or near water in stream side areas or canyons. The male is clearly recognizable, but the female may be mistaken for the female Magnificent, as they are the two largest hummingbirds in North America, and both brightly colored. As always, mother nature is never boring, and changes it up so we never cease to marvel at the splendor! From the tiny Bumblee species to the largest, each one has it's own uniqueness. The male does not rely on aerial displays like some of the smaller species, but uses vocal sounds to both attract a mate and defend his territory. This beautiful jewel can have up to 3 broods a year, and the female uses the same nest to build another on top of it, therefore creating “towers” of nests. Although they are seen mostly in the southwest, accidental or rare visits are made to southern United States. Another name for the Blue-throated hummingbird is the Blue Mountain Gem. Besides the Magnificent "jewel" they can also be mis-identified with the Broad-tailed, Violet-crowned and White-eared hummers.